To read more on how to make yuca fries please visit me over at Our Krazy Kitchen. I was invited to join the great group of food bloggers at Our Krazy Kitchen. My friend Martha with Seaside Simplicity invited me to share Saturdays with her Kris and Joanne. 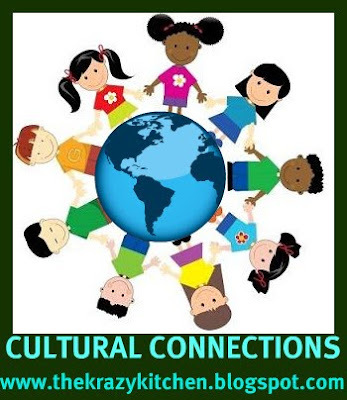 I will be introducing Cultural Connections and will host every 3rd Saturday. Sometimes I will be re-posting older recipes from The Tiny Skillet, you all forgot about them any way...just breathing new life into them. Feel free to let me know what you think, and if you have anything you would like to see me explore! Enjoy! Who wouldn't like these fries! I do, my kids do, my hubby do.... Will hop over to check that out. Have a great weekend, Lynd! Have never every tried Yuca fries - although I lived in Colombia (1974 .. ) where I tasted yuca for the first time and discovered and loved yuca bread. I love the idea of recipes from all over the world! These look great! I haven't used yuca, thanks! I really love these yuca fries! look awesome! Fries looks great n crunchy...def gonna give a try soon. Kristy, my daughter thinks they're just good. My husband finishes the whole plate, have to watch him, he will eat them all. Oh, thank you Ann! So nice of you to say! Laura, I think they have yuca every way you would want it in Columbia. I'll have to try the yuca bread. Martha, thanks for making me feel so welcome! Fimère, they are irresistible, just ask my husband, he eats them all! Debbi, hope you get a chance to try them. Gloria, Thank you. I will try some other yuca recipes. yuca fries look great! i have never cooked with yuca before; but something i plan to do soon. I grew up in south Florida, and have always enjoyed yuca. There is no doubt that I would really enjoy these yuca fries. I've never tried yuca. It is on my list of things to try. I serve it with a "Mojo de Ajo". For my boyfriends birthday Im making this with "Chicharrones" and serving with "Moros" (steamed black beans and rice), and some salad and assortment of fresh fruit maybe flan. I like the idea of baking the yuca "frita." A healthy alternative. Thank you for your kind words on the blog. To answer your question...yes I find making my own breads, pasta, puff pastry very theraputic. I have a stressful Mon to Fri, so come the weekend, I must unwind. I love yuca, we usually fry it. Great job! Looks delish! I'm going over to the Krazy Kitchen right now! I love Yucca but have never tried making fries. This is a must try with my next batch of burgers. Velva, yes yuca is easy to find and easy to use, I'm sure you'd like them. Nathan, Sounds good. I know they are usually fried just wanted to try it, and we liked it. I'll have to try it with Mojo de Ajo". Rebecca, and Victor, thank you, I'm trying not to fry too many things! Catherine, thanks for checking it out. Ward, I think you'd make them taste great! I love Yucca but I never make fries out of it. I will usually steam it and make dessert out of it. Sounds like an interesting event! I don't think I have tried yuca? They look delicious. I saw yucca at the market, I'll have to pick some up. I love yuca!! !Yuca fries are delicious. I served Yucca fries to the girls....they weren't sure about them, but we will have to try them again!! very interesting fry!